Gutters defend your home against rainfall, and prevent against problems with your foundation, roof, attic, siding, and paint. When your gutters become overly clogged, they cannot function correctly, and leave your home vulnerable. When you need gutter cleaning in Waco and Temple, TX, trust our professional crew for rapid, exacting work. To ask questions or set up service for your home, give us a call at 254-716-8685 today. Your rain gutters have a very important job to protect your home’s strength and functionality. They keep water drained properly to prevent problems like soil erosion, flooding, and foundation washout that can cause major damage to your home. Your gutters also prevent moisture and debris from entering your roof and underneath to the attic which can not only cause roof underlay damage but can contribute to insulation damage. When they are clogged or backed up, water seeps over the edge or through seams creating leaks within your system and water problems on your walls and in your yard. Our professionals can rid your gutters of all debris and buildup to ensure free-flowing water no matter how hard the rain is with our gutter cleaning in Waco and Temple, TX. As an integral component of your home’s functionality, your gutters shouldn’t be trusted to just anyone. 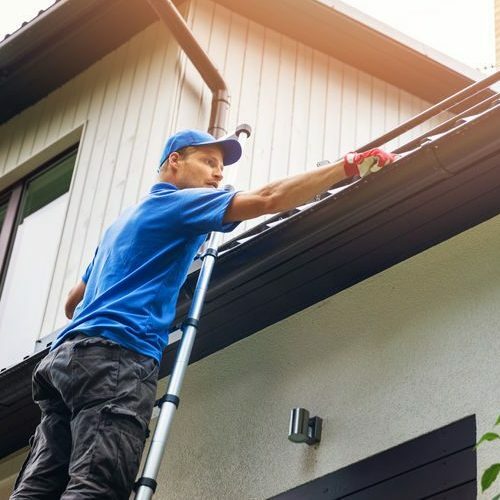 Our experienced professionals will not only clean and flush your gutter system, but we will also perform a thorough inspection of your entire system looking for cracks, peels, sagging, and any other issue that may occur. We will check for damaged parts that may need to be replaced, and advise you on the appropriate maintenance procedures and timelines to keep your home beautiful. Don’t live with dirty gutters that cause stains on your walls and flooding throughout your yard. Call our professionals to clean your system with no stress or inconvenience to you. Our professionals can perform your gutter cleaning in Waco and Temple, TX alone or in partnership with our additional services such as asphalt driveway installation, crack repair, and exterior wall pressure washing. For comprehensive service that leaves your home clean and neat, call our experts at 254-716-8685 to schedule your consultation.